Atletico Madrid forward Antoine Griezmann (R) steps away from Sevilla midfielder Daniel Carrico during the La Liga match at the Wanda Metropolitano stadium in Madrid on September 23, 2017. 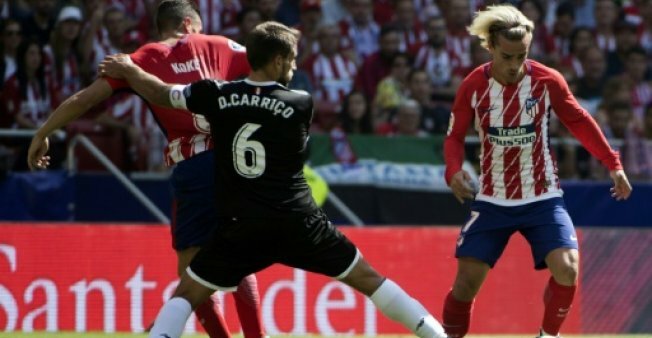 MADRID - Diego Costa watched on from the directors' box as Atletico Madrid leapfrogged Sevilla into second in La Liga thanks to goals from Yannick Carrasco and Antoine Griezmann in a 2-0 win at the Wanda Metropolitano on Saturday. Diego Costa watched on from the directors' box as Atletico Madrid leapfrogged Sevilla into second in La Liga thanks to goals from Yannick Carrasco and Antoine Griezmann in a 2-0 win at the Wanda Metropolitano on Saturday.